The authors taking part in the event will also be the judges of the competition entries. These will be judged in three age categories: Early Primary (P1 – P4), Late Primary (P5 – P7), Secondary (S1 – S6). At the moment, the following authors are confirmed – Caroline Clough, Lari Don, Janis Mackay & Alette J Willis. Find more information in the national Glow Group Glovember – Glow Book Month. You will need a Glow password to access this. The Glow Science website has just been updated with 130 new short films focussing on chemistry and physics, and covering everything from the periodic table to Newton’s laws of motion. Supported by learning materials and ideal for revision purposes, these short films will motivate and engage learners. Glow Science covers the four science disciplines: biology, chemistry, physics and earth science. A Glow log-in is required to view these materials. 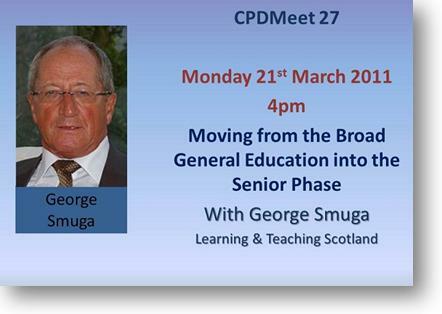 CPDMeet is next Monday with George Smuga, who is going to be leading – Moving from the Broad, General Education to the Senior Phase. George Smuga is currently acting as a free lance consultant working with Learning and Teaching Scotland and a range of local authorities. George was Head Teacher at The Royal High School before being seconded to the Scottish Government as a Professional Adviser in 2007. Prior to this he was Head Teacher at North Berwick High School and for a period was seconded to work with East Lothian Education and Community Services Department. Whilst with the Scottish Government, George was involved in the drafting of Building The Curriculum 3 and undertook a large number of engagement events around the country to explain the key messages of BtC3 and to help local authorities and schools in implementing its recommendations. He worked with LTS colleagues in the Testing the Framework initiative – this later became known as Building Your Curriculum. Recently George has been active with LTS in helping to develop Senior Phase case studies and to continue to work with Head Teachers, curriculum planners and local authorities in work on this aspect of curriculum planning. This will obviously be a must-participate discussion for anyone involved in curriculum planning in secondary schools, especially in the senior stages of secondary. The discussion will take place in the CPDCentral meeting room next Monday, 21st March at 4 pm. It just takes a few simple steps to sign up – all you need to do is follow the instructions on the information panel in the link to the CPDMeet here.